What happened at Starbucks in Philadelphia? Starbucks drew national outrage over the weekend after two black men waiting for an acquaintance in a Philadelphia store were arrested for trespassing. Charges ultimately weren’t filed. 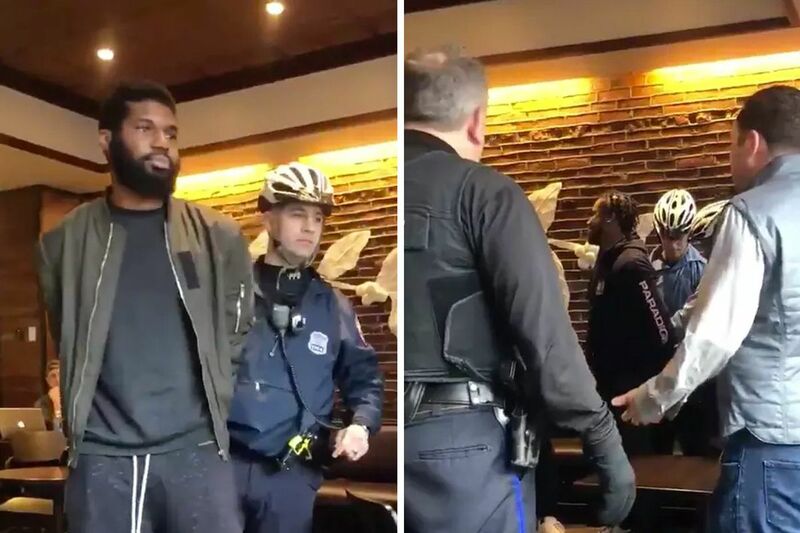 The arrests of two black men at a Philadelphia Starbucks last week has prompted nationwide outrage, protests at the store at 18th and Spruce Streets and the departure of the manager who called police to the coffee shop. The two men, whose identities remain unknown, were sitting at a table at the Starbucks at 18th and Spruce Streets on Thursday afternoon. They were waiting for an acquaintance, but didn't make any purchases. When they refused to leave, a store manager called police, who arrested both men and led them out of the store in handcuffs. No charges were filed, as Starbucks declined to prosecute. A video of the arrests was posted to Twitter by Philadelphia-based author Melissa DePino, which quickly went viral and sparked outrage nationwide. The video has been viewed nearly 10 million times. Philadelphia real estate investor Andrew Yaffe asked why officers were called and attempted to explain to police that the two men were waiting for him. "What did they get called for, because there were two black guys sitting here, meeting me?" Yaffe asked. "What did they do?" A longer video of the two arrests shot from a different angle doesn't reveal anything before the moment police arrive. But it shows the two men remained calm throughout the entire encounter with police, including when they were handcuffed and led out of the store. The second video also shows more of the back-and-forth between police officers and customers inside the Starbucks location, though the noise of the crowd makes it difficult to hear what was said. In an interview with the Inquirer and Daily News, Starbucks CEO Kevin Johnson called incident "reprehensible," vowing to work with store managers and employees to address any "unconscious bias" across the coffee chain. He made similar statements in an interview on Good Morning America. Johnson is in Philadelphia, and said he hopes to offer a face-to-face apology to the two men. Johnson is also set to meet with Mayor Kenney and Police Commissioner Richard Ross and other community leaders Monday, a spokeswoman for the Seattle-based company said. In a video posted to Facebook on Saturday, Police Commissioner Richard Ross defended the officers involved in the arrest, stating they acted appropriately, though he added the incident was yet another reason the city should expand the department's body camera program. "The police did not just happen upon this event — they did not just walk into Starbucks to get a coffee," Ross said in a video posted to Facebook Saturday. "They were called there, for a service, and that service had to do with quelling a disturbance, a disturbance that had to do with trespassing. These officers did absolutely nothing wrong." John McNesby, president of Fraternal Order of Police Lodge 5, also defended the officers involved in the incident, saying they "acted very professionally." "I can't control what people think," McNesby said of the controversy surrounding the arrests, adding that the officers "did their job." Police spokesman Troy T. Brown said the department's internal affairs investigation is "active and ongoing." Kenney said in a statement calling for a review of Starbucks policies that the incident "appears to exemplify what racial discrimination looks like in 2018."